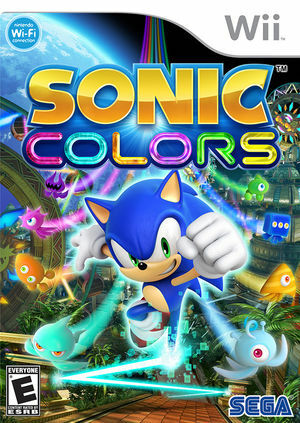 Sonic Colors (ソニック カラーズ Sonikku Karāzu in Japan, Sonic Colours in European and Australian markets) is a 2010 platforming game in the Sonic the Hedgehog series. 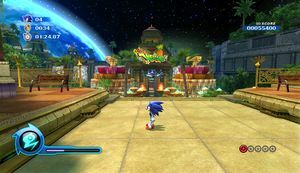 The game has similar gameplay to the 2008 game Sonic Unleashed, using both side-scrolling and third-person perspectives. 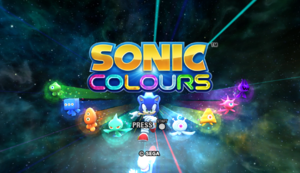 Sonic Colors is capable of using both GameCube controllers and Wii Remotes. If a physical controller is set to emulate both a GameCube Controller and a Wii Remote concurrently, it will operate both devices at the same time. To fix, migrate controls to use separate physical controllers. When playing the PAL version in 50Hz mode, the game is significantly darker than in 60Hz modes. This occurs on console and is not an issue with Dolphin. To avoid this, use PAL60 mode when playing the PAL version of the game. Certain music effects, such as muffled and quieter music in underwater sections and muted music while going though pipes with the Drill wisp, are missing under DSP-HLE. The effects don't play in HLE. Boosting music plays properly though. All music effects work properly under DSP-LLE. Refer issue 10069. Enter this as an AR code in the game's configuration settings. This patch will unlock the game's frame rate from 30FPS on actual hardware to 60FPS. It can cause some minor physics issues (nevertheless, the game can still easily be completed). Reaching frame rates >30 FPS may require checking Store EFB Copies To Texture Only and/or increase the Emulated CPU Clock. This code will make completing Asteroid Coaster Act 2 difficult at the point shown below. Using Boost should allow getting past. Aquarium Park, Act 1: The scripted loop at the beginning of the level bugs out, sometimes sending Sonic out of the stage to his death. To fix this, simply disable the 60FPS patch for that particular section. Save states can be used even when the patch is enabled/disabled. 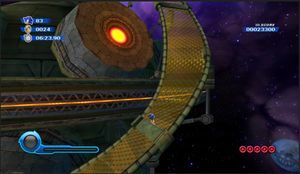 Every level: Noticeable lines appear under Sonic and stay for the whole game. Disabling anti-aliasing fixes this. Tropical Resort, Act 1: If you jump at the right spot, the game will freeze. LLE Play underwater and other sound effects appropriately. 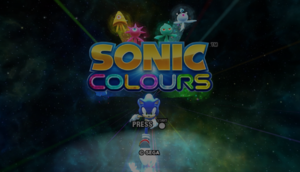 The graph below charts the compatibility with Sonic Colors since Dolphin's 2.0 release, listing revisions only where a compatibility change occurred. r3661 Windows XP Intel NVIDIA GeForce 7100 Around 15FPS. r3661 Windows 7 AMD Phenom X4 @ 3GHz NVIDIA GeForce 9800 GT Around 30FPS, lags in some places. r6603 Windows 7 Intel Core i5-750 @ 4GHz ATI Radeon HD 5870 Around 43+ FPS (unlimited, normal is 30). Only Some graphic problems, but barely noticeable. r6790 Windows 7 AMD Athlon II X2 240 @ 2.81GHz NVIDIA GeForce GT 240 OpenGL: 15-20FPS, no graphic or sound problems at all. r7128 Windows XP AMD Phenom II X2 @ 3.50GHz ATI Radeon HD 4650 25-30FPS (80%-100%), Perfect game play. r7564 Windows 7 AMD Phenom X4 9350e @ 2.01GHz NVIDIA GeForce 9600 GT Black screen after SEGA logo with Direct3D9; crashes at start up with OpenGL. UPDATE: Perfect with Direct3D9. I've disabled Progressive Scan, so black screen... never again! r7719 Windows 7 Intel Core i5-2500K @ 3.3GHz AMD Radeon HD 6950 Perfect. 30FPS in DX11 with AA Samples 4 (quality 16), AF x16, and Internal Resolution x4 (2560x2112), at 1920x1080. 4.0-4760 Windows 7 Intel Core i5-540M @ 2.53GHz NVIDIA NVS 5100M Playable, 30-60FPS during stages. Menus at 60FPS. HUD visible. Running at 1x IR, no AF or AA. This page was last edited on 18 December 2018, at 13:14.